I’ve already gone on about Cal Peternell and his fantastic book, Twelve Recipes, haven’t I? Quick check of the archives says that yes, indeed, I have. Well, I won’t belabor the point, but I really think most people ought to own this book. His methods for making toast alone are worth the cost of the book, and I’m actually not kidding. This is the most perfectly toasted bread I’ve ever achieved! What more can you ask for in this world?? Truly, though, this is a book that’s useful for all of us, from new cooks to seasoned ones. There are fantastic instructions for all of the most important simple things, like toast and eggs and boiled vegetables, as well as ideas for making these building blocks into all sorts of delicious meals. And the simple things are the most important things, are they not? When we made these little omelets for the first time back in August, filling them with thinly sliced tomato, caper and olives and pairing them with a crusty baguette and glasses of rosé, as instructed by Cal, Ben said it was one of the best meals we’d had in some time. At first, I was upset. It was so easy! It couldn’t be the best! What about the more elaborate meals I’d cooked up in recent weeks, what with my sudden unemployment and all? The silky corn soup, elaborate bento bowls, homemade pizza, seeded galette, beer-steamed clams… And then I realized, what a silly response! This is a meal that can be ours in a good deal less than thirty minutes, any time we want it, and it’s amazing, in part due to its simplicity. If this is among the best meals we could have, then I am all for it. Though few of us would eschew an elaborate home cooked meal or dinner out, I’m always most curious to know what people are cooking for dinner on any given weeknight. A friend asked me recently for breakfast ideas, and I waxed poetic about overnight oats made with homemade, unstrained almond milk and plenty of fruit to prevent boredom and lack of texture, Megan Gordon’s genius method of toasting oats before cooking them up into a hearty bowl of oatmeal, all of the things one might put on toast in the morning, savory grain bowl preparations and the like. And this was actually helpful, in a way that my musings on perfect pie crust or pain d’epi just might not be (though, of course, there is a time and place for these as well). It turns out that one of the best things I’ve eaten lately was a simple snack late last Tuesday night, after my shift at Ordinaire. I slathered halved and toasted lengths of baguette with goat cheese, drizzled olive oil atop and finished the tartines with flaky sea salt. It was exactly what I needed. I added tahini, honey, lemon and Aleppo pepper flakes to one slice, which was exquisite. And yet I would never serve this for dinner. But why ever not? Why is it so easy to doubt that something simple could be this grand? The simple stuff, in food and in life, is the good stuff. Easy weeknight dinners, sleeping in, sparkling wine popped for the hell of it, laughter with friends, going to Children’s Fairyland with one of your best pals and her kid, big bowls of popcorn, fat slices of cake to eat in the afternoon, celebrations of any size. And these humble little omelets, of course. 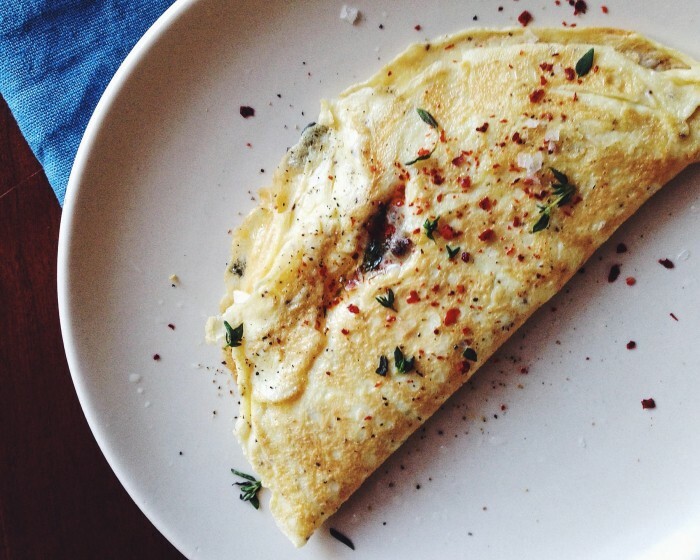 Pair your omelet with baguette and rosé if you really want to take things over the top. Bliss can be simple, after all. Peternell makes the excellent point that a one-egg omelet is, texturally, much like a crêpe in the most pleasant of ways and gives the filling the chance to shine. He suggest making multiples rather than a many-egg omelet if you’re feeling hungry. Plus, though one egg doesn’t sound like much, these little omelets never look sad on the plate. Crack the egg into a medium bowl (“large enough to take some action,” says Cal). Add the milk or water and season with salt and pepper. Whisk until thoroughly mixed and free of any streaks. Heat a skillet, then add the butter, olive oil or ghee. (If using butter, you’ll know you have the heat right if it melts then foams gently.) When the butter stops foaming, or the fat is nicely warmed, add the egg. Tilt the skillet around so that the egg covers it all. When it’s set all over, only slightly liquidy and just in the center, add the filling to the side you’re flipping onto (if right-handed, the left side; if left-handed, the right). Run a spatula around the omelet to loosen the edges, then slip it under the unfilled side. Fold it over the filling, turn off the heat and cover the pan with the lid for a couple of minutes. Peek inside. If the omelet is set as you like it, tilt the skillet over a plate and slide the omelet out with a spatula. If making many, keep the omelet warm in your oven, at low heat. This i truly a simple recipe but very delicious!! It looks amazing and I am sure it tastes amazing too! Perfect for breakfast!